I never really had the chance to meet my father. I was only 18 months old when he was killed in Vietnam. Throughout my life I often wondered about him, what kind of man he was, how he lived and died. I didn't know that for 25 years my father's closest friend had been looking for me, anticipating my questions, anxious to share the answers with me. Publication of the above photo on the cover of the 1997 1st Cavalry Division calendar set in motion a chain of events that finally brought Doug Sterner and I together. When we talked for the first time on January 20, 1998 one of my first statements was, "Tell me about my father." That night he faxed me the pages of a small booklet he wrote in 1973 shortly after my father was killed in action, a booklet he had never published but had kept along with my father's letters to him throughout the years. This booklet told me more about my father than I could have hoped for. I am happy to share it with you here in honor of the hero I never really met, my father, Jaime Pacheco. Life is often measured in terms of months, decades, and years. For the young soldier facing combat on foreign shores life can be defined, and lost, in fleeting seconds. In one moment of horror a bond was born between Jaime Pacheco and I in Vietnam, a bond that would impact my life forever. In yet another fleeting second, Jaime lost his life. This booklet was written six months after Jaime was killed in Vietnam. I never really intended it for publication and perhaps thought of it more as a personal diary or journal. The single copy I made in 1973 remained archived for 25 years with my black beret, Jaime's letters, the letter from our Ranger Executive Officer detailing Jaime's death, and a letter from Jaime's wife (written to me a month after Jaime died.) Through the years and several moves, all of my photos and other physical memorabilia from two tours in Vietnam were lost. Only the aforementioned survived the quarter century. Of all the photos, copies of news stories I had written, and other personal memorabilia; the one I lamented the loss of most was a picture taken of Jaime and me shortly after the mission referred to in this booklet. But through the years I found I did not need a photograph to keep Jaime constantly in memory. As an active public speaker much involved in veteran's programs, I talked of Jaime often. And throughout the years there was seldom a night that I did not wonder where Michael Pacheco, the boy who was only 18 months old when his father was killed, was. My four children knew both Michael and Jaime by name, though they had never met. My reoccurring dream was that one day I would visit Jaime's grave in Hobbs, New Mexico; and while standing there would finally meet his family. Of the millions of photographs in the historical files of the First Cavalry Division, the fact that the picture of Jaime and me that meant so much would one day be "randomly" chosen and published on the cover of the 1997 Cav calendar, is beyond coincidence. I should not have been surprised, for it seems God has interwoven Jaime's and my life from the moment we first met. With the publication of the calendar, I felt a renewed urgency to find Jaime's family and share the calendar with them. On January 20, 1998, a year after the calendar was published, I received a long distance call from Texas from a young lady identifying herself as Lenay Pacheco, Michael Pacheco's wife. After all the years, all the wrong phone calls and lost letters, thanks to the staff at Angel Fire, New Mexico, Jaime's son and I would finally meet. The phone conversation that evening was long and emotional, but a dream come true. Michael asked, "What can you tell me about my father?" For the first time in more than 20 years I pulled this booklet from my files and reread it. When I finished I felt that it said more about Jaime and who he was than anything I could say over the phone. That same evening I faxed a copy to Michael. The following day, after making photocopies for myself, I sent him the originals of Jaime's letters, written in his father's own hand twenty-five years before. Within a month I was contacted by one of Jaime's sisters, and shortly thereafter spoke with Jaime's mother. I shared with them copies of the calendar, and Michael shared with them copies of my fax to him containing this story. At their request I am sharing it herein. Almost without exception, it is word-for-word as I wrote it months after Jaime's death. As I speak and visit with veterans groups around the country, I am constantly amazed at how the friendships forged in battle so often become lifetime associations. The friendship Jaime and I shared was not only forged in battle, it was nurtured by God. Though Jaime is gone, the impact of his life on mine has survived not only the test of time, but his own death. In many ways when I speak, write, or serve our Nation in any capacity; I like to believe that a part of Jaime Pacheco lives on in me. On Memorial Day, 25 May 1998, 26 years to the day after Jaime's death, I met Jaime's family. As Michael and I went through his father's personal effects, he handed me a box containing a Bible. As I held it in my hands for the first time in 26 years, I opened it and read the inscription: "To Jaime Pacheco, From Doug Sterner, 15 March 1972." That same Memorial Day, wearing the original beret presented to me on behalf of Ranger Team 75 by my closest friend, I held Jaime's mother in my arms as she introduced me as her "oldest son". At the close of Memorial Day Services in Angel Fire, NM I was overwhelmed by emotion as I watched my 21 year old daughter join hands with the 28 year old son of Jaime Pacheco on the platform of the Vietnam Memorial to sing "God Bless America". Today my best friend's son calls me "dad", and though I know I can never replace the father he lost, I have made the commitment to become the father he found. Somewhere above I believe Jaime is looking down at me with a smile on his face and saying, "Doug, you were a true brother." God is Good! A trickle of sweat began to inch down my forehead and sting in my eyes as I struggled through the thick brush. The heavy pack crushed my back and the straps cut through my shoulders. Despite the shade of the dense jungle foliage, the heat was stifling and seemed to burn through my whole body. I put a hand to my face to brush away another bead of perspiration and it came away covered with the green stain of camouflage face paint I was wearing. My back still burned like a thousand tiny needles were piercing the skin, the grim reminder of the consequences of stumbling over a red ant pile. There was an irritating pain in one leg and I knew at least one leach had "hitched a ride" as I'd crept along. Ahead a ray of sunlight was breaking through the brush indicating we were near a clearing. Knowing how dangerous it could be to cross an open area, I gripped my rifle more tightly in my sweaty hands. A branch hit me in the face making a scratch that soon stung with the salty burn of sweat. "Nineteen more days and I will be home," I thought silently. "Home, away from Vietnam, away from the jungle, away from the heat, the leaches, the red ants; and yes, away from the war. My thoughts were interrupted when Stubby, the man ahead of me, turned and whispered one word, "Dinks", our slang term for the enemy. Instantly I froze, my eyes scanning the trail we were breaking out on. Another trickle of sweat rolled down the tip of my nose and I suppressed an urge to brush it aside. My heart was pounding like a drum but around me all was quiet. Too quiet! It was uncanny. "Nineteen days, " I thought again. "What am I doing here?" Suddenly there was the sharp, staccato beat of automatic rifle fire. No time to think now. I threw my pack to the ground hanging on to my rifle and my camera. I hit the edge of the clearing at a run and flung myself to the ground behind a mound of dirt, my AR-15 rifle spitting flame and lead almost before I felt the hot dust beneath me. "X-ray, X-ray, this is 75, 75, Contact, Contact, Contact," I could hear our radio man Specialist Four Jaime Pacheco yell into the radio. "How many were out there?" I wondered. There were only seven of us, a mere handful of men. Then came the dull roar of a detonating hand grenade and a cloud of smoke and dust rolled over my position. "I must have been crazy," I said to myself as I kicked an empty magazine out of my weapon and inserted another 30-round clip. Then I had to laugh a little under my breath. "Me, crazy?" That was just what everyone else had been calling me. For a year and a half my friends had called me crazy for the foolish bravado I exhibited. When I arrived in Vietnam it was to work in the capacity of a combat engineer. But three months before my second tour was to end I was transferred to the 3rd Brigade, 1st Air Cavalry Division and employed as a correspondent for the military news media. Because my tour was nearing its completion I'd been informed by my superiors that I would not be allowed to go "in the field" for my stories, but would work in the office and around our base camp at Bien Hoa. I was not one to sit behind a desk for long, and was even worse at following orders. I started making trips to the jungle against orders "bouncing with the Blues", our quick reaction force, on several missions. Our commanding officer would review my stories and photos, shake his head, and forbid further excursions. "You're too short (our slang term for having a short time left in our combat tour) to be going in the field," he would say. "I don't want to have to write your parents and tell them, 'I know Sergeant Sterner was supposed to be home in a couple of weeks but.....'." His protests aside, he continued to publish my stories and photos. I kept returning to the jungle for more. I enjoyed the freedom of going out with different units and being where the action was, but before my tour ended there was one story I was determined to get, one I was sure would be an exclusive. For years our office had tried to get a correspondent on a mission with a team from H Troop, 75th Rangers. All efforts had failed, not so much because Rangers were publicity shy, but because the nature of their mission was so unique that an untrained man could mean disaster. These men who wore the much envied black beret were an elite unit that hunted the enemy in the most silent and deadly fashion. Working in teams of five or six men, they were famed for their occasional reconnaissance missions. Their most common mission however, was what they called "hunter-killer" missions, operations where they stalked the enemy with stealth and skill using highly honed guerrilla tactics to out-maneuver and ultimately destroy him. After more than a year of unsuccessful attempts to write and photograph the Cav's rangers in action, our public information office had given up on the possibility of getting that story. I wasn't satisfied and boasted that before my tour ended, I would get that story. My superiors in turn told me that even if the Ranger company gave their consent (in itself considered an impossibility), they would not allow me to take the job. Normally any man with less than 30 days "in country" was kept on the base camp. I had been consistently in the jungle right up through the Tet holiday just four weeks before my scheduled return home. Then, miraculously, the Ranger commander gave his consent for me to accompany a team on a mission. No one in our office could understand the change in their attitude and not until later did I understand the reason. For though, at the time, some of the men in our office believed that it was my persistence and military record over two tours that persuaded the Rangers to take me on, I know now that God had a plan behind it all. "Sergeant Sterner," my senior NCO said just before I left on my first of several missions with Ranger Team 75, "You really are crazy!" And then I was one my way--my last mission in Vietnam and the chance to get my exclusive story. Actually I would actually pull several missions with the team in the short time remaining in my tour. My first lasted only a few hours. The chopper inserted the seven-man team just before noon and at four in the afternoon we walked within ten feet of an enemy soldier hidden in the dense jungle. When the firing subsided we were extracted and flown back to Bien Hoa for the night. The following morning we were inserted again in another area. So here I was, two contacts in two days, and my tour of duty almost over. I knew I had to make this one good. Remembering what my job here was, I jumped to my feet and snapped a picture. In that brief instant I saw a flicker of flame. One of our grenades had started a brush fire. Before I could move Jaime was rushing forward at a crouch to beat out the flames. I snapped another picture, then sent a burst of fire from my weapon to cover Jaime's return to his position. Overhead I heard the beat of helicopter blades slicing the air above the trees. Our team leader was barking instructions into Jaime's radio, "We have movement to the south, about a hundred yards out." Then came the crash of rockets and the scream of a Cobra gunship making its lethal dive. Another grenade thundered and I slapped a fresh magazine in my weapon and continued to fire. And then silence came. The enemy had withdrawn, the fight was over....for me at least. The team leader jerked his head my way. "Sterner, cover the trail for the radio man," he said matter of factly, treating me as a member of the team and not just a correspondent who was along for the trip. I responded by moving to the center of the trail and taking up a defensive position while a reconnaissance element went out to check our "kill zone". The recon team found a bunker complex and was gone for some time. Then came the sound of a grenade and Jaime turned and said, "I hope that was one of ours." I nodded grimly and, suddenly realizing how thirsty I was, got out my canteen and took a long drink. I offered it to Jaime and between the two of us it was quickly drained. Still thirsty, we made short work of Jaime's canteen, then went to work on the five quart flask in his pack. As we waited for the recon element to return we had time to talk and snap a few more pictures to send home. We were two soldiers who had just survived a moment of danger together, and that puts a unique bond between men. Such bonds were not uncommon among the soldiers who fought in Vietnam, but soon Jaime and I would find an even stronger bond, one that would tie our lives together for eternity. It was Sunday night and as usual I was at our chapel for the Sunday evening service, the only one of its kind in our unit. It was a very informal service consisting of lively singing, personal testimonies, and group sharing. We were singing when I heard someone coming in late and turned in time to see Jaime take a seat near the back of the chapel. He caught my eye and nodded and I acknowledged his presence with a similar silent nod of the head. This was Jaime's first visit to our chapel service, and knowing he was Catholic I was somewhat surprised to see him visit our less orthodox worship session. When the service concluded I invited Jaime to stick around and visit over a cold soda. As we walked to the group in a corner of the chapel I told him, "It sure is good to see you here, Jaime." It had only be a few days since I had pulled my last mission with Ranger Team 75. I had written my story, made copies of all the pictures for the men of the team, and was busily getting my affairs in order to depart Vietnam the following week. "It's good to be here," Jaime replied with a smile, and I knew he sincerely meant it. "You know something Doug," he continued, "It is kind of funny the way we met. I knew the first time I saw you that you were a Christian and God had sent you out with our team just so you and I could meet." Now I smiled. "Yes Jaime, that is the way God is. He works out all these things with some master plan we may not understand, but it all has a reason. I wouldn't want to be here and not be a Christian. It really is a good life." "It sure is Doug. Boy, I'll tell you something, God is sure good!" And that was the first time I heard Jaime mention the phrase that I now associate with him in every fond remembrance. The following evening I was again at the chapel, this time to practice some music with "The King's Children", a gospel singing group I had started on the base a few months earlier. We were singing a Bill Gaither song titled "Jesus, There's Just Something About That Name" (the song you are hearing in the background now) when I noticed Jaime come in and again take a seat at the back of the chapel. As we sang I saw a noticeable glow in his eyes, and when we finished he looked up quietly and said, "I hope I'm not interrupting anything, but that is the most beautiful song I have ever heard. Would you sing it again for me?" We did, and as we sang one couldn't miss the tears that formed in Jaime's eyes. I couldn't help but think that there sat a man deeply in love with Jesus Christ. Several times that week Jaime returned to listen to us as we practiced, and always he would ask us to sing that same song over and over again. It became his favorite, as well as ours. Often during that week Jaime and I would talk late into the night. He had many questions about the Bible, about Jesus, and about living the Christian life. In that week we became close, very close. For me it was a new experience for I had always been somewhat of a loner who avoided close ties to any person. But in that last week a bond of brotherly love grew between us that I shall never understand or forget. Jaime also spoke often of his family back home, and especially his wife and small son. He informed me that his wife made "the best Mexican food you have ever ate and will ever eat. A Big Brag but it can be kept." We made a pact that, when Jaime finally returned home I would come and visit his home in Hobbs, New Mexico, meet his family, and prove his brag about his wife's cooking. Mid-week came and on Wednesday Jaime left on a mission with his team. I hoped and prayed he would get back before I left for home as I was scheduled to depart the following Monday. Sunday arrived all too quickly but I was thrilled to see Jaime walk into the chapel service that evening. He took a seat beside me in the front and together we sang, we prayed, and we worshiped God. When the service concluded we gathered again at the rear of the chapel to visit. I spent a good deal of time saying "good-by" to my friends before they returned to their barracks. When everyone else was gone I turned to Jaime and said, "I have to stop by the office tonight, so I can walk that far with you on your way back to the Ranger compound." We stepped outside the chapel and the beauty of the night was enough to warm the heart. The sky was clear with a scattering of stars and a bright moon. The air was warm with a breeze that was refreshing but not too hot or too cold. I was struck by the magnificence of God's creation, even in a war zone. "Thank you God", I said silently, "for beautiful nights like this, and for the kind of friendship You have given me and Jaime." As we walked we talked again of family and friends, but mostly about Jesus. There was a real sadness in parting but it was also a time of joy in the realization that, when the bond of Christian love exists, you are never far separated. Then we were at the door to the Public Information Office where I was to clean out the last of my personal effects. We paused for a long moment of silence, neither of us wanting to say goodbye. For a moment I felt guilty. For months I had tried to extend for yet another tour and been denied each time. I wanted to stay in Vietnam and was being sent home anyway. Jaime had a wife and young son. He not only wanted to be home, he needed to be home. I wished that somehow we could trade places, even wondered if I was deserting my friends by leaving. It was an emotion packed, awkward time of silence, neither of us wanting to say goodbye. Then Jaime looked at me and smiled. "You know Doug, God is good." I smiled again at his classic statement. "We won't say goodbye, for we'll meet again someday, somewhere." "Yes, Jaime," I replied fighting back a rush of tears, "we'll meet again. Just as soon as you are back in the States I'll be knocking on your door, just waiting to try your wife's cooking." "Whatever happens, God IS good!" "Yes Jaime, He sure is." "I better be going Doug. Amigo, Asta Leugo." And then he was gone, walking away into the night. The tears came as I watched him leave. And then, just before he disappeared from view I experienced a strange feeling. I knew that I was looking at Jaime Pacheco for the last time. Before I'd left Vietnam I'd learned from Jaime that he did not own a Bible. My first concern upon my arrival home was to purchase one. I had his name embossed on the cover and mailed it to him along with several religious paper back books. A few weeks later I got my first letter in reply. When I'd been with Ranger Team 75 there had been talk among the men of awarding me their coveted black Ranger beret. The team had chosen to do so and asked Jaime to mail it to me. It is one of the very few mementos of my Vietnam service that I still have, and it is indeed the one that means the most to me. In his letter Jaime talked mostly about how good God was and how much it meant to him to be a Christian. There was some talk about the team and how things were going in the "bush", mention of family and home, and repeated mention of how much he enjoyed his new Bible and other books. It was closed with four words that became his standard closing line in every letter: "In Christ, Your Brother, Jaime Pacheco." A few weeks later another letter came. "I don't know what our good Lord has for me," Jaime wrote, "but I tell you, when He leads or shows me to where He wants me I'll know I can't ever be happy unless I do as He wants me to. As for my going home, I don't know yet. I'll just let Him take care of that as He has taken care of me in all things." I read and wept unashamed at his simple faith in God and the way he unreservedly committed his entire life and future into God's hands. Before he closed with "Your fellow Brother in Christ," Jaime wrote, "I know if it be Our Lord's will to go back to the States alive and well, we, my family and I will meet again some day." Every night I would lay in bed and pray that God would keep His hand on Jaime, would keep him safe and free from harm, and bring him safely home soon. I waited eagerly for each letter, and the third arrived shortly after Jaime had written it. It was dated 12 May, 1972. By this time Jaime knew that it would be some time before he would be coming home. As a Ranger he was much in demand and the rash of troop withdrawals would not affect him. "Man let me tell you," he wrote, "I am ready to go home right now! Personally I would, like I said, go home right now, but if I had my way I would like to go the 15th of June so I could be there for her (his wife's) birthday, and after all out processing, arrive at my home town the morning of the 20th of June. But the way things look it seems that it will be more like in August or the very latest, October. But at any rate, I am going to let God lead me and use me according to His will. Yes, that is the way to be Doug, God is Good." He closed the letter as my brother in Christ as was his usual pattern. In this letter there was a slight change in the closing lines, however, it was two months before I was to notice it or understand what it meant. I continued to pray for Jaime, asking God to protect him. Every day I would check the mail which came to my father's house in Montana, in hopes there would be another letter from Jaime. In the previous weeks Jaime had been asking me to tape some Gospel music to send him. I had been singing with some friends in a neighboring town, and every time we got together to sing I thought of my promise to send Jaime some music. Somehow, we just never seemed to get it done. I was thinking about this as I drove home from work one day early in June. I would be visiting my musical friends that very weekend and resolved that whatever it took, I was going to get Jaime's tape made. As I passed my father's house on the way home I stopped to check the mail. There was one letter, from the Department of the Army. My hands trembled as I opened it, knowing deep inside what it was going to say. The black type blurred beneath a rush of tears. I struggled to believe it said something else. But no, there is was in black and white, "I regret to inform you that Specialist Pacheco died on 25 May, 1972." "God, no!" I cried in anguish. As I struggled to drive home, my vision blurred by tears, I couldn't help repeatedly asking, "God, why?" Then bitterness crept in. "God is good," Jaime had written just 13 days before his death. Somehow it was hard to accept that fact now. How could a good God allow something like this to happen? Of all the people, why Jaime? Throughout the sleepless night the question arose again and again, "God, why?" And then guilt again, and anger at being home. "What if I had been there? Could my being with Jaime in that moment of danger changed the outcome somehow?" I'd lost many friends in Vietnam, but somehow this struck a nerve that wouldn't heal. Of all the people, why Jaime? It just didn't seem fair. Where was God? A couple weeks later a letter arrived from the executive officer of the Ranger detachment detailing for me how Jaime had died. Jaime had been covering the rear of a recon element that walked into an enemy bunker complex. As the firefight ensued Jaime realized the danger that threatened the three men ahead of him. Leaving his more secure area at the rear of the team he rushed forward firing his weapon and throwing more than a dozen grenades, permitting his comrades to safely withdraw. Then, as the team pulled back, a round from a malfunctioning helicopter mini gun struck him and took his life. 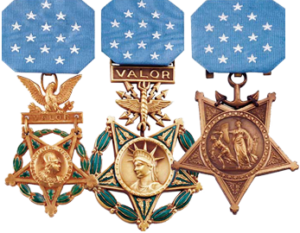 For his heroic actions that day, Jaime was awarded the Silver Star Medal. But the point that stood out far above his heroic actions was the love for his comrades that compelled him to risk his life that they might live. It was so characteristic of the Jesus Jaime loved so much Who once said, "Greater love hath no man that this, that a man lay down his life for his friends." Of Jaime Pacheco, the Ranger executive officer wrote: "I can honestly say that he is one of the few in this world who had no enemies." Still I couldn't help wondering, and questioning God. The following Sunday I attended church with a mixture of anger and puzzlement in God's failure to protect my friend. The choir stood to sing, and the song was Jaime's favorite, "Jesus, There's Just Something About that name". Again I could not restrain the tears. Then came the letter from Jaime's wife, a letter filled with both sorrow and faith. "Yes, 'God is Good'," she wrote. "It is my wish and prayer that the 'Good God' continue helping me face my future with a smile, a smile at God in loving acceptance of whatever He sends into my life now, so that I may merit to have the radiant, smiling face of Christ gaze on me for all eternity." Still I wept long and bitter tears. For two months I mourned and questioned, wondered and wept. Few had been my acquaintances that had been allowed to become so close, and despite my puzzlement at how God could have allowed Jaime to die, I knew deep inside that the bond that had grown between us had been nurtured by God for some unknown reason in His master plan. I picked up Jaime's last letter to me and read it as I had so many times in the previous weeks. It was so bright and characteristic of Jaime's simple faith, and as I read I could almost picture the light in Jaime's eyes and the smile that was so uniquely characteristic of him. I read it again, "Yes, that is the way to be Doug, God Is Good." I found that statement a little hard to accept now that Jaime was gone. At the letter's end he had written, "Amigo, Asta Luego," and I remembered that warm night in Vietnam just scant months earlier when we had parted and Jaime had vanished into the darkness with those words. And then, finally, his closing signature, "In Christ Your Brother...." but wait, there was something sandwiched between the words in capital letters, something I had never noticed before. Yes, this letter written just 13 days before Jaime Pacheco would sacrifice his life for his friends, was closed "In Christ, For Eternity, Your Brother, Jaime Pacheco." For the first time a warm glow filled my heart and a smile came to my face in the sweet, powerful realization of what Jaime had told me in that final goodbye. Somehow he sensed he was not going to be coming home, that he would die in Vietnam. He also knew he was prepared for that moment. It wasn't really goodbye after all. "In Christ, for Eternity, Your Brother." "Yes my brother," I said aloud to myself, "God is good". The huey "Slick" hardly seemed to stop in its descent on the clearing before Ranger Team 75 was on the ground and moving rapidly to the edge of the jungle. As I lunged through the underbrush I glanced back long enough to see our rear scout, Sp4 Kenneth (Snuffy) Anderson backing out of the clearing in a crouch, ready for any signs of the enemy. I wanted desperately to stop for a chance to shoot a picture, but now wasn't the time. We had to get to cover before the enemy had a chance to locate us. The pictures would have to wait. Once the team was concealed in the brush, Sgt Paul "Blinky" Morguez, Team Leader (TL) for 75 motioned for us to sit down. It was a relief to drop my heavy pack and relax in the brush. Some where a bird began to sing, and it was almost possible to forget that you were hiding in enemy infested jungle, just a handful of men and their weapons. Sp4 Jaime Pacheco, RTO for the team, unsheathed his radio. When the TL began to make his report to the rear he spoke only in a whisper. No one made any noise. Quietly I unsnapped my camera, focused it, and pushed the button to release the shutter. It sounded like a bomb dropping in a sound proof room and everyone turned quickly to look at me. A little embarrassed, I put my camera up and resolved that my pictures would have to wait a little longer. After about 20 minutes the TL felt confident that the enemy had not noticed our insertion and had not come in our direction. We hitched up our rucks and began moving through the brush. There were no trails, no paths, we just walked and crawled where we could, never making a sound. No one spoke, not one vine was cut from our path, and so well hidden was each man by the heavy brush and camouflage jungle fatigues and face paint that often I would lose sight of "Stubby", Sgt Lynn Morrison, who was walking just ahead of me. My ruck was beginning to give me pains and sweat poured off me. It was rough on me, and try as I might to hide it, anyone could see I was tired. I started glancing at the other members to see how they were taking it. They were sweating too, which made me feel a little better. That is, all except "Blinky" who I was sure by now could out walk a horse. Someone once said that Rangers don't have to shoot the enemy, they just hump them to death. I was beginning to believe that was the truth. There were times I wished I had packed a little more, though my ruck was more than heavy enough for me. But a five-day log of supplies to a Ranger seemed awful meager to me. Three LRRP meals won't last the average grunt a day and a half, and I was expected to make them last for five days. And six quarts of water, a two day supply for most grunts, had to be stretched out over that same five day period. Finally we paused for a few minutes. It was getting well along into the afternoon and the heat seemed to be reaching extremes. I lifted my canteen to my lips, rationing myself the barest amount of water, and settled back to listen. There was a crackling of brush that made my heart beat a little faster. I strained my eyes and saw two chickens strutting about. They walked within 20 feet of me but so quiet was the team that they never realized we were in the area. Twenty minutes later we were moving on again. We were reaching an open area and "Stubby" stopped beside me. "When we cross this area," he said, "make sure you step on the branches and not on the ground." It seemed strange to me, but Stubby explained that in the open area if the enemy were near they would see us, so the sound of a breaking twig made little difference. Now the important thing was to insure that we left no footprints for the enemy to find. Later Sp4 Pacheco explained that the Team tries to leave no evidence of its presence after it has passed. "We even eat the plastic containers our LRRPs come in so the enemy can't find them," he said with a laugh. We finally stopped in a small clearing and I decided to chance a few more pictures. Muffling my camera as best I could with my towel, I took a few shots, then helped myself to a drink from my canteen. We'd been in the jungle for about four hours and yet my canteen was practically full. It was surprising. It was getting dark as we moved on, though it was still early in the evening. Then the Team stopped. Blinky was on the point and had broken onto a trail. While we waited he scouted the trail with Sp4 Melvin Mullis, the assistant TL who had been walking "slack". Then they motioned for the team to move up. I was just breaking through the under- growth when the world exploded. Dropping to the ground I worked out of my ruck and alternated between shooting pictures of the elite team in action, and talking back to the hidden enemy with my AR-15 rifle. For Blinky it had been close. 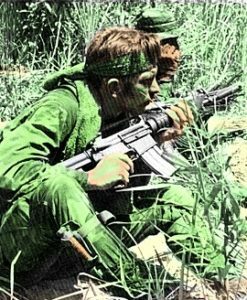 Breaking from the trail and into the open, he had heard a man to his left shout at him in Vietnamese. The enemy soldier had undoubtedly mistaken us for NVA or VC troops. He had been no more than 10 feet from Blinky when he spoke, and the TL had answered with a burst from his AR-15. "Make sure you cover our rear," I heard Blinky yell, and then from back on the trail I heard Snuffy yell back, "Yeah, I've got it." "Frag out," yelled 1Lt Lynn Moore, the Ranger operations officer who was along for the trip. As he stood to throw his grenade the team covered with a burst of fire. "Someone pass me a cigarette," yelled Blinky, crouching now and firing from the hip. Then Pacheco, talking into the mouthpiece of the radio, "X-ray, X-ray, 75, 75. Contact! Contact! Contact!" Then all was quiet again save for the sound of Blue Max waiting overhead. Blinky took two men and scouted the area where the enemy had been. All that could be found was a thick trail through the brush where he had "duffed". Pacheco and I sat back drawing long gulps on our canteens. We could drink all we wanted now. We had a contact and would be pulled out. When all was clear we moved into the open and popped smoke for our bird. While the skids were still well above the ground I felt the other members of the team boosting me in. Then I turned to haul them aboard. The door gunners opened fire on the area and we left with tracers tearing the brush in case any enemy had followed us to the PZ. As the chopper circled we could see Max diving in on the position we had just left, tearing the jungle with his rockets and mini gun. We were on our way back to the rear for a hot meal, a cold soda, a shower and a good night's sleep. My job was finished but for Team 75f there would be tomorrow, another day, another mission, and perhaps another contact.